Late last year, I was invited to The University of Iowa for a few days — while there, I was introduced to the School of Art and Art History building that was completed in 2006. Unfortunately at the time of my visit, this building and several others were closed and off-limits due to severe flooding that ravaged the university campus. 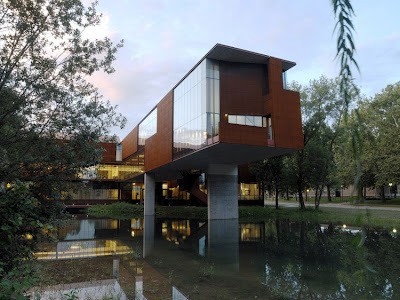 Flooding aside, the building is an impressive feat of architecture designed by the firm Steven Holl Architects. The link provided goes directly to the School of Art and Art History building, but if you have a few minutes to explore, much of their additional work is quite impressive as well.